ESCO (Equipment Supply Company) proudly announces their new new line WHEEL+AID, Rust Eliminator and Lubricant. WHEEL+AID is a specially formulated, Non-fiber, light viscosity fluid that offers exceptional tire and rim protection when added to the tire air chamber and is recognized by the Environmental Protection Agency [EPA] in the United States. WHEEL+AID lubricates the inner tire bead, for quick tire removal and for perfect bead seating when mounting tires. Not only acting as a rust eliminator/lubricant, WHEEL+AID also acts as a tire coolant, running tires 7.5% cooler, therein extending tire tread life and saving on retreading and overall prolonging the life of the tire. 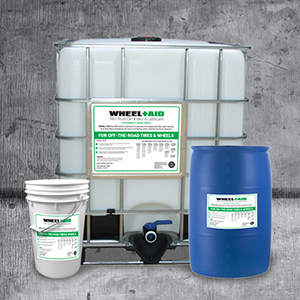 WHEEL+AID is designed for off-the-road tires and wheels (see application chart for details) and comes in three different packaging sizes: 6-Gallon [Model 10925]; 55-Gallon Drum [Model 10926]; & 275 Gallon Tote [Model 10927]. WHEEL+AID Rust Eliminator and Lubricant is available wherever ESCO products are sold. For more information about this product and where to buy ESCO product email sales@esco.net or call 352-754-1117 or visit www.esco.net and search “WHEEL+AID”.